Excited to share some Data & Analytics themed blog posts with you in the coming weeks. Our 2015 MITX Data Summit Advisory board has contributed some fantastic posts to give you a taste of the exciting content that will be discussed at this year's Summit on June 23rd. Interested in attending? Register here. This guest blog post is written by Victor Davidson, VP Group Account Director, Marketing Analytics at Havas Media. Victor is the analytics lead for several of Havas Media's clients. 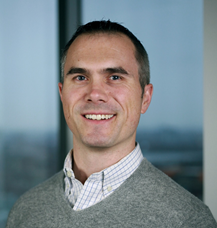 As part of this, he manages big data, ad tech and attribution consulting for his clients. One of his greatest achievements was the implementation of a new KPI which helped deliver a 50% increase in ROI. He joined Havas Media from Lightspeed Research (a WPP company) where he was a Senior Research Manager of Behavioral Research. He comes with over 10 years of analytics and client service experience with companies like Forrester and Catalina Marketing. Victor has worked across a number of verticals including financial services, travel and CPG. There’s been a lot of good discussion in the industry around the post-cookie world and what it means for advertisers. In some cases the conversation has been spurred because internet browsers like Firefox have toyed with blocking third-party cookies as a default. In other cases, people think cookies may start to fall out of favor due to heightened privacy concerns. Either way, it’s an important discussion that the industry needs to be having. As of right now, a big part of the targeting and evaluation of media is done via third party cookies, and if that disappears, it begs the question of whether the digital ad industry will take a giant step back. One of the proposals that I hear being tossed around is that the major social media platforms will use their unique customer IDs as the new currency of tracking people across the web. In some ways, Facebook has already started moving in this direction. Advertisers can work with Facebook’s new adserver, Atlas, to target media delivery by demo (age, gender) and cross device. This targeting leverages Facebook’s stable, customer-level identification. The big drawback, is that to take advantage of some of the more compelling targeting, the advertising needs to happen within Facebook. This walled garden approach is great for Facebook, but not so good for marketers and agencies. Additionally, this raises another concern - a conflict of interest. Most major social media sites are also in the business of selling media. It seems odd to me that the industry would end up rallying behind a solution in which a single media property (Facebook) that actively fights for limited marketing budgets would be given exclusive abilities to measure advertising delivery and performance. Another possibility for dealing with the loss of third-party cookie data is a consortium of identification across publishers. According to Comscore, FB has approximately 200mm unique visitors, which represents about 80% of the total digital population. While this is a large majority of the internet, it’s not the only means of connecting with a broad portion of the internet. 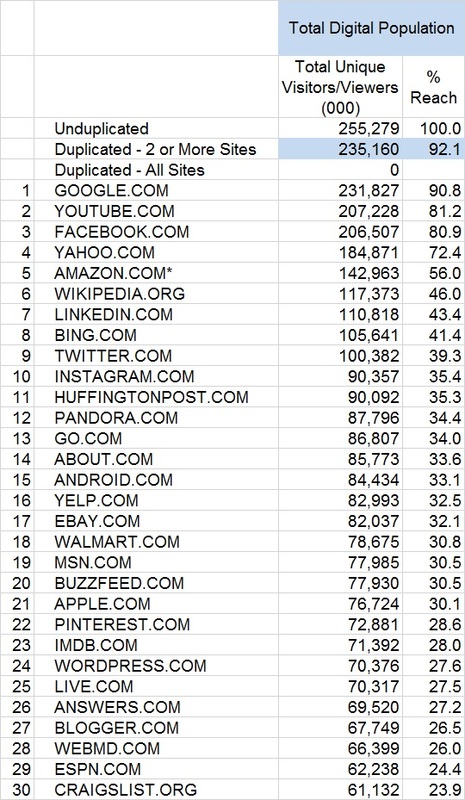 If we consider some of the top 30 sites (as reported by Comscore), who use digital advertising as a primary income stream, their unique visitor count easily amounts to the same as Facebook. For example, Huffington Post, Yelp, ESPN and Pandora have an aggregate visitor count of 322mm. Obviously there’s some degree of overlap among that group, but my point is that a handful of publishers, each of whom have a solid amount of logged in users, could complete with the first party data of Facebook. Much like IXI does for financial services, these content providers could create a shared identifier based on their own first-party data that could then be purchased and used by the broader advertising ecosystem. Clearly this isn’t an issue that will be solved in a day, but I’m excited to hear the opinions of the speakers in the upcoming MITX conference related to privacy and the cookieless web. By sparking these types of conversations before we see a major industry change, we will all be better prepared to take action when the changes do end up coming along.